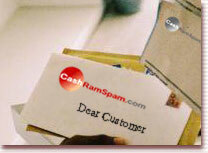 CashRamSpam is an email program that virtually guarantees that you receive only the emails that you want to receive. No longer will you need to spend hours checking through your post making sure you are not deleting something important because now all your emails are important. CashRamSpam makes sure that each email you receive pays you real money. And the best part is you decide how much they pay you!! Click here to find out how it works. This year send someone the most useful and unusual present they'll receive for a long time. Send them a spam busting CashRamSpam email account. Just open an account, fill in for them their 'User ID' and 'Password' and then send them off to the lucky recipient! They can change the password once they log into the account. Seed money can be earned if customers correctly answer the questions found at 'Paying Promotions' in the Gold Pages. Once you own a CashRamSpam account you can if you want set your 'Preferences' to receive paying SMS messages from advertisers and at no time do they ever know your phone number! NEW!! Buy real gold and silver using your CashRamSpam account. Buy as little as AUS$50 worth of gold or silver at market prices and have it added to your CashRamSpam account to be used for future purchases or just hang on to it and see what happens in these difficult times. Don't forget to download the CashRamWallet Android APP from the top right hand corner. (Please note spot prices and currency exchange rates could change dramatically at any time plus CRS adds 10% service charge. For Gold allow 3 days to complete purchase, silver up to 4 weeks). Read more.. Check to see if you are losing good emails through hyperactive spam filters. Click for more info…. ©CashRamSpam.com, 2001. All rights reserved.